Picture a supernatural being of diminutive human form and possessing magical powers. What do you call this magical personage? A fairy? Or perhaps you favor faerie? What about fay or fey? Each of these words has a slightly different history, with different connotations in fantasy now. We'll start with the basic fairy. 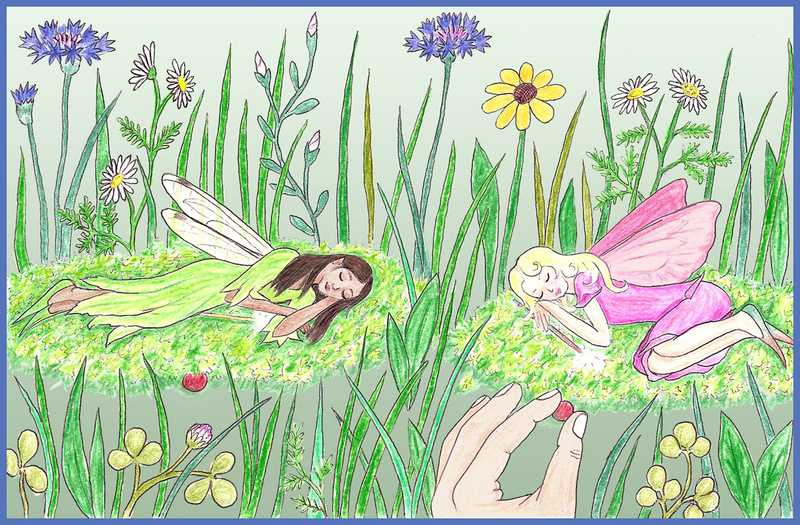 fairy - This word entered modern English around 1250-1300 from Middle English faierie, (They sure didn't stint on vowels, did they?) which was borrowed from Old French, and which ultimately derived from Latin Fata, fate. Its first usage, now obsolete, was "enchantment," as in "Don't believe your eyes; all that you see is fairy." The next twist to the meaning, now archaic, was "the realm of magic and magical beings, fairyland." And finally the word came to mean the little people themselves, which is how it's used now. How little are the Little People really? That has varied widely from legend to legend and throughout history. Sometimes the fairies are tiny, sometimes taller than humans, sometimes so insubstantial or illusory that their size is mere appearance without reality. But generally speaking, I think fairies tend to be small, while faeries are more human-sized. 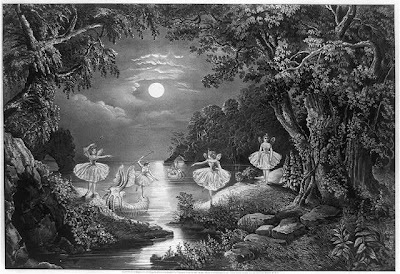 faerie, faery - The primary definition of these variants is given as "fairyland," and the second usage is as an adjective describing the magical land or its denizens. "A supernatural being" is a more minor definition. We have Edmund Spenser to thank for this spelling being in use at all. While spelling variations certainly occurred throughout the early history of the word, it was Spenser who deliberately chose these spellings in the late 1500's for The Faerie Queene, his masterpiece of shameless flattery for Queen Elizabeth I. The faeries in Spenser's poem have little to do with the fairies of folklore, and his use of the alternate spelling has left a legacy of different connotations for the different spellings. I think of fairies as being diminutive sprites, wilder, more mischievous, probably cuter… While faeries are more noble and courtly, but possibly also more powerful and dangerous. However, I also tend to see this spelling as rather pretentious and faux Ye Olde - which, perhaps ironically, may have been exactly how Spenser intended it when he chose it back in 1580.
fay - Again, this word was originally an adjective and is only recently shifting to include a noun definition. It appeared in English around 1350 - 1400 from Middle French feie or fee, but ultimately from the same Latin root for fate, as in a spirit in control of the future, and hence any sort of magical spirit. 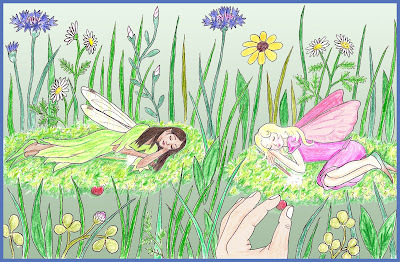 I think of a fay fairy or fairyland as being particularly wild and unpredictable. fey - Defined as "whimsical, strange, supernatural, enchanted," I assumed this word was just another one of the spelling variations in the family. Surprise! It's a much older word, and from a completely different root. Fey was in English before 900, deriving from Old English faege, meaning "doomed to die." The ultimate derivation of the word is unclear, but its development seems to have moved from weakness and timidity through visions and premonitions, to suffering from enchantment, to a sort of etherial insanity. When used for the people of Faerie, however, I think fey retains its connotations of strangeness, otherness, and danger. Which spellings do you prefer? What different connotations do the different variants evoke for you? 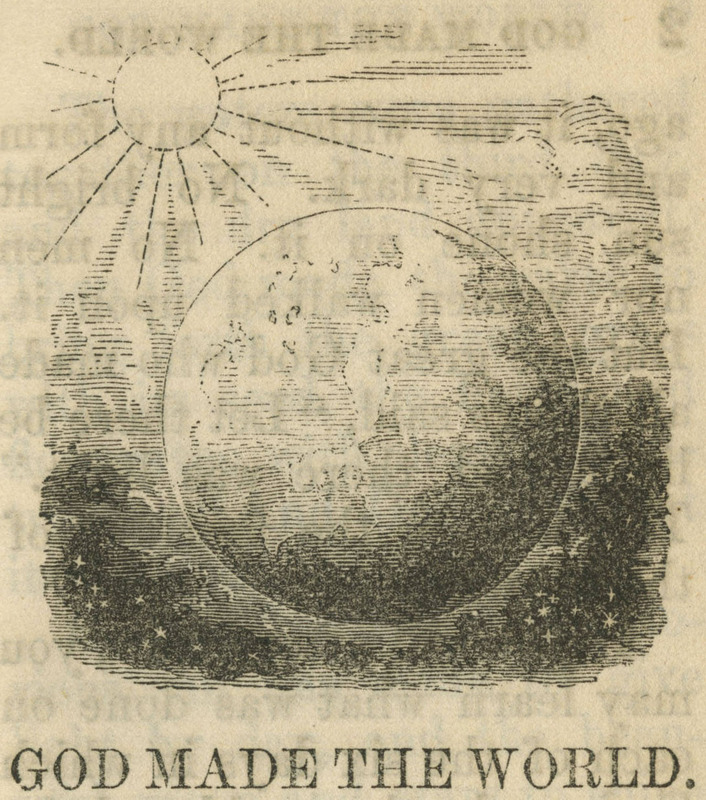 The American Sunday-School Union was the most prolific publisher of children's books in nineteenth century America (which gives you a good idea of why non-didactic books like those by Lewis Carroll and Beatrix Potter were so beloved!) 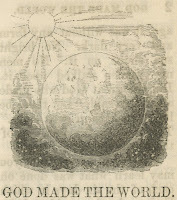 But the American Sunday-School Union publishings did have lots of illustrations, mostly printed from wood engravings. These wood blocks were the property of the publisher, not the artists, and were kept and reused through multiple printings (and probably multiple publications, too.) Although names of some of the artists are available, including George Gilbert (d. 1836), Alexander Anderson (1775-1870), John Warner Barber (1798-1885), Augustus Kollner (b. 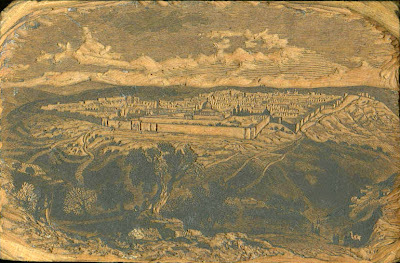 1813), and James Barton Longacre (1794-1869), the individual blocks are not labelled with their artists or their carvers, so they're effectively anonymous. 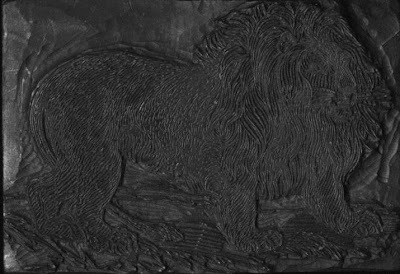 carved away areas, especially backgrounds, appear black when they ought to be white. 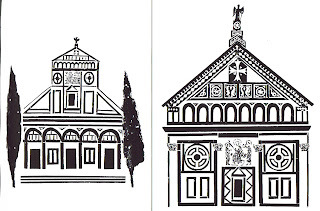 For the block print of the Earth you can see all three images: the photo of the carved block, the approximation of its image, and a page from a printed book in which the image actually appears. You can see how hard it is to get a sense for the finished print by looking at the block or its scanned approximation! Still, it gives you an idea, and the real value of this collection is the ability to see the carving of the blocks themselves. I love the grace and delicacy of this lily, and the sly glance of the lion below. 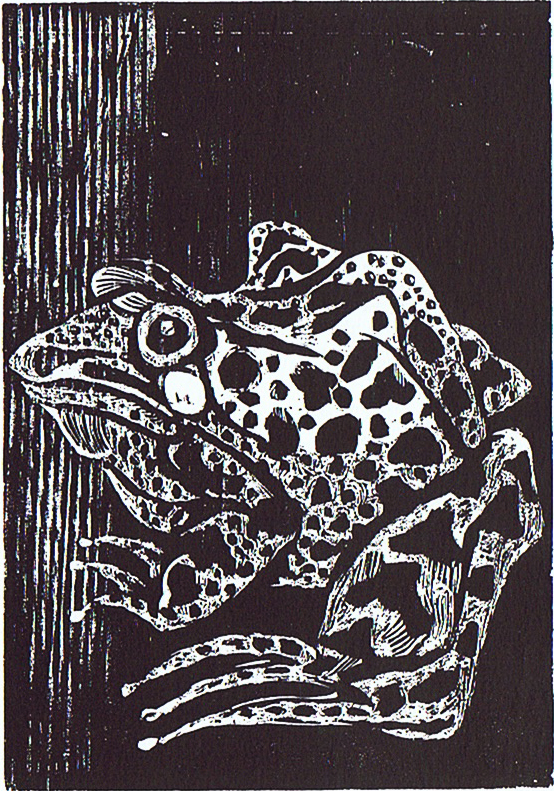 Since these are nineteenth century wood engravings they are all about the tiny little lines, reproducing line drawings as opposed to really using the unique properties of the relief print medium. You don't get much of a sense of carving from looking at the print. But that's why it's so much fun to be able to see the carved block itself and really see the strokes of the tools where wood has been carved away. Juvenile fantasy has been a hot genre since the success of Harry Potter, and I couldn't be more delighted. I used to think I'd read a pretty good sampling of the genre, but now there are way too many new books coming out every month and I can't possibly be an expert even in the stuff with lots of buzz. (Besides, there's no way I'll ever read all the new stuff when I don't do vampires!) But of course the down side of all this new stuff is that a lot of really excellent juvenile fantasy falls between the cracks, gets forgotten, or doesn't get the notice it deserves. So today I'll list a handful of books that I think are not very well known. I'll be surprised if there aren't at least one or two that you've never heard of. And if you have a favorite gem that you think needs more attention, please let us all know! The Facttracker, Jason C. Eaton, 2008 - We all (P, T, and I) got a big kick out of this one. The just small enough boy (who has no name because all his facts about himself have gone missing) and the Facttracker (whose job it is to supply the world with facts) must save their town (and the world) from being overrun with lies (most of which are very silly). The philosophy of the importance of lies struck me as a little suspect, although I guess if you substitute the word "fiction" for the word "lies" then I'd be happy with it… But the real joy of the book is its exuberantly oddball goofiness. The goofiness begins even before the story begins, if you bother to read the dedication, which starts out with the usual family members and editors, blah blah blah, but about halfway through goes on to "I'd like to thank… Todd for inventing a new computer that auto-writes novels for you whilst gently massaging your feet and whispering 'life is water' over and over,… Cindy for informing me that a giant hula-hooping ninja space robot was trying to steal my new computer, Parnell and Marinoff for helping me defeat the space-robot with the power of love and an even bigger robot, Grant for defending me before the intergalactic tribunal…" and so on. It gets zanier. There are no hula-hooping ninja space robots in the actual book, but there are snails, a good explosion, a mountain of sweet potatoes, an octocycle, tuna fish sandwiches that never go bad, and a lot of lies. Jane's Adventures In and Out of the Book, Jonathan Gathorne-Hardy, 1966 - This is not one of the all-time greats, I admit, but it's a good fun read that hits lots of favorite fantasy themes. Jane (who conveniently lives in a castle with parents who are never around to cramp her style) discovers a book whose pictures transport her into their scenes. With this fun device Jane gets to have serial adventures involving, among other things, a heroic resistance group, a giant jungle, being bug-sized, a sinister sultan, and (outside the book) a great flood. It would be a good introduction to inviting kids to imagine where they might want the book to take them. Ronia the Robber's Daughter, Astrid Lindgren, 1981 (1985 in English) - This book is apparently pretty well known in Europe and was adapted into a movie there, but I don't think it's so well known here in the US. Lindgren is more famous here for Pippi Longstocking, and this book definitely involves some of the same themes of letting children run wild and fend for themselves. The plot is a standard Romeo and Juliet set-up, with Ronia and the son of the feuding tribe's chieftain becoming friends despite the enmity of their parents. The writing makes the characters strong-willed, infuriating, charming, likeable, and altogether believable. 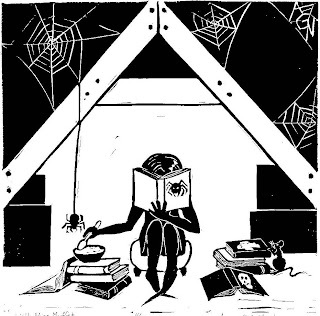 The descriptions of the setting and the children's self-education in the woods are lovely. Once on a Time, A.A. Milne, 1917 - This really isn't juvenile fantasy, although there's nothing in it that a child shouldn't be reading. But its irony and wry commentary will probably be over the heads of most children. Nevertheless, it deserves a mention as a great example of the fractured fairy tale. There's a plot to take over the throne by an addict of largesse-throwing, there's a war involving kings disguised as pig farmers and an iconic ginger mustache, there's a prince enduring a very embarrassing transformation, and a maid who wants nothing more than to be able to dance like a fairy. 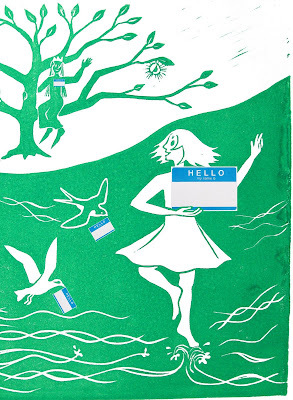 It's funny and satirical and sweet, and it ends happily ever after. The Rise and Fall of Mount Majestic, Jennifer Trafton, 2010 - In this book our hero, a messy girl with a missing father and a missing blue hat, finds herself in the position of having to preserve her island home from the certain destruction that will result if the giant sleeping beneath the mountain should wake up and rise. Along the way are some great characters, including the selfish king, the perpetually worried Worvil, a big-footed Rumblebump, and our hero's mother, who has very strong moral objections to everything from turnips to giants. P did not like the beginning at all - it had too much scariness and grouchiness, and we hadn't had a chance to become sufficiently fond of the characters to make it seem worthwhile - but I convinced him to let me keep reading aloud for a couple more chapters, by which time all three of us enjoyed it very much. I hope you find something new and enjoyable here! Picasso (1881-1973) is, of course, one of the most famous artists, his name synonymous for many people with twentieth century art. Personally, I find much of his art more interesting than appealing, but he was certainly prolific enough that everybody ought to be able to find at least a few of his pieces they really enjoy! 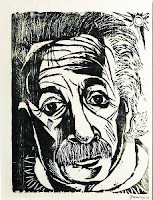 One of his pieces that I really enjoy is this linoleum block print. states. Looking at it, however, I'm not sure how that technique produced the red and green printed without any overlap. 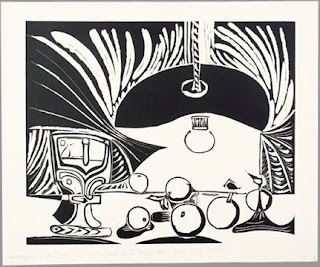 Of course, one thing Picasso was a real master of was experimentation, so it would hardly be surprising that he and his printer Arnèra came up with plenty of techniques that I haven't thought of! Here's an interesting image of the final state of the block, printed in black only. For once I don't like it better than the color version! For once it definitely looks like only a small part of the whole. 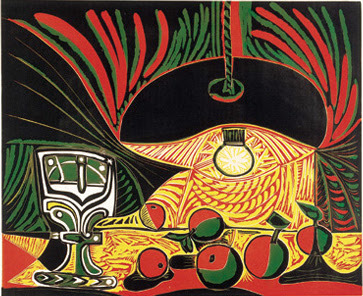 I like lots of things about this "Still Life by Lamplight," especially the design of the goblet and the patterns of the red and yellow light, but my favorite thing of all is the lightbulb and the starry glow around it. 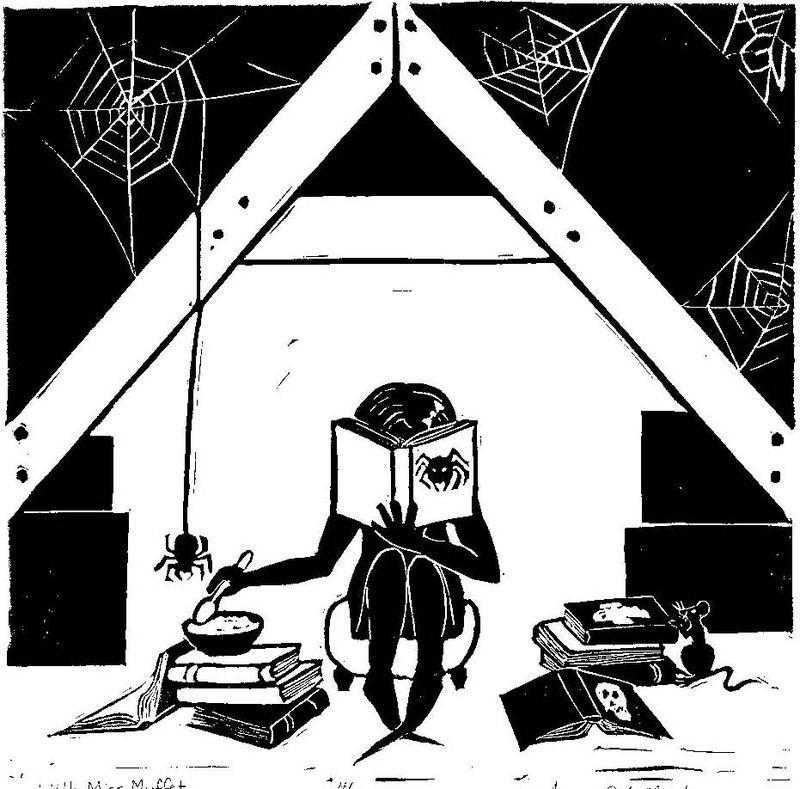 Edgar Allan Poe (1809-1849) dabbled in many genres, particularly horror and mystery. (His work was influential in multiple genres, too.) If you count ghosts, angels, demons, and the supernatural as Fantasy then a large proportion of his work includes at least elements of fantasy. An interesting element of Poe's work, though, is that his stories and poems are usually ambiguous enough to admit of at least one interpretation in which everything has a logical explanation, as in "The Fall of the House of Usher." Even when fully supernatural things occur, Poe's narrators are often insane or drug-addled to the point where the reader is not required to believe in the accuracy of anything they report, as in "The Black Cat," "Ligeia," and "The Tell-Tale Heart." That makes them a little questionable as fantasy. 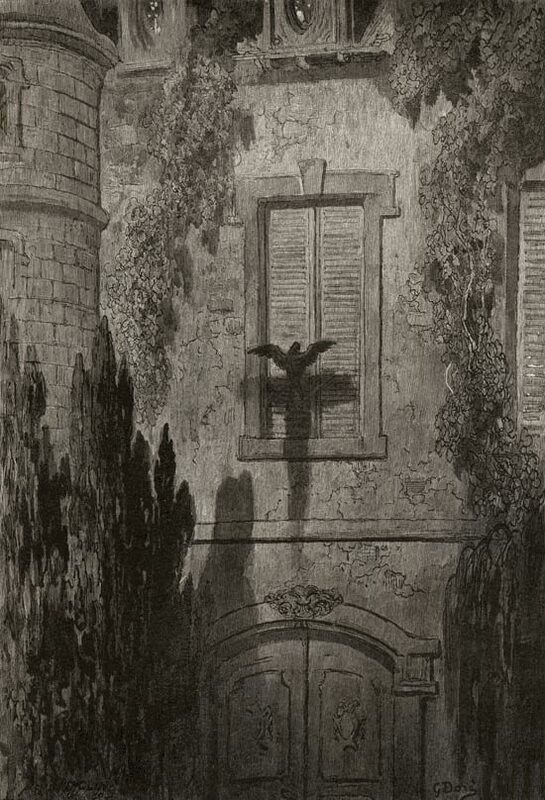 Into that category falls his most famous poem, "The Raven," (1845). 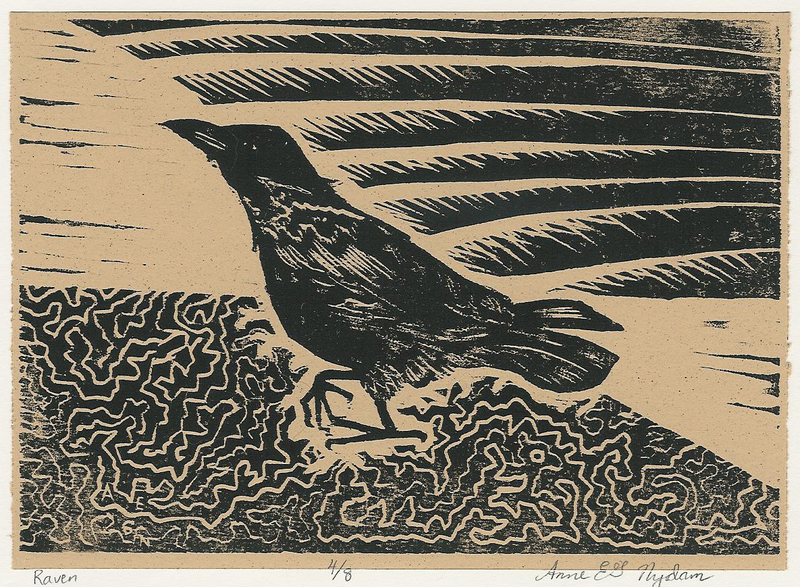 Like much of Poe's other work, I think "The Raven" hovers near the edges of the fantasy genre. But if nothing else, the dense, magical-sounding language evokes that fantasy feeling of wonder, mystery, and possibility -- even if it is the Gothic possibility of horror. Horror has definitely never been my thing, but the language of "The Raven"
I was thinking about maps and unexplored territory the other day, and the exciting and romantic phrase "Here be dragons" signifying the terror and wonder and limitless possibility of the unknown… Only it turns out that the saying "Here be dragons" is almost as fictional as the dragons themselves. Apparently there exists only one old map with the phrase. 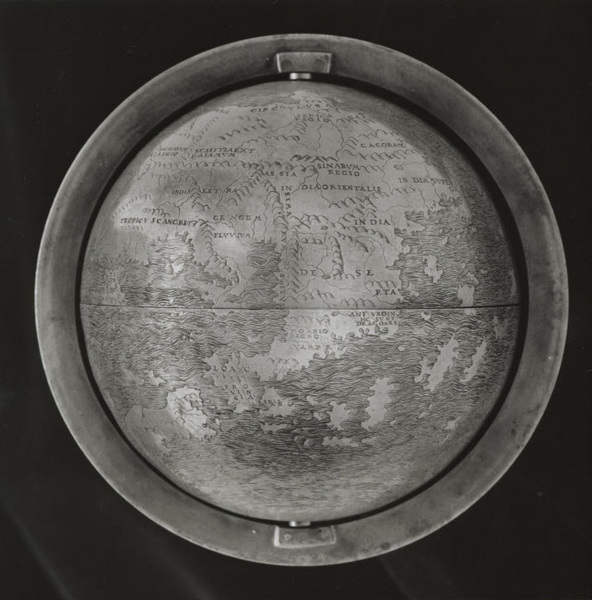 The Hunt-Lenox Globe from around 1503-1510 has the Latin HIC SVNT DRACONES on the eastern coast of Asia. (Alas, not visible in any photo I could find.) Whether the phrase was ever intended to refer to actual dragons is also a subject of debate. Clearly this was not a phrase medieval cartographers used to describe the unknown. So, what's the deal with the dragons in unexplored territory? And how did the myth of "Here be dragons" arise? For the first question, there are certainly a fair number of ancient, medieval, and renaissance maps with pictures of dragons, mythical beasts, or real beasts that seemed every bit as fantastic as dragons to people at the time. For example, elephants and walruses both feature on maps as strange, monstrous creatures inhabiting exotic territories. 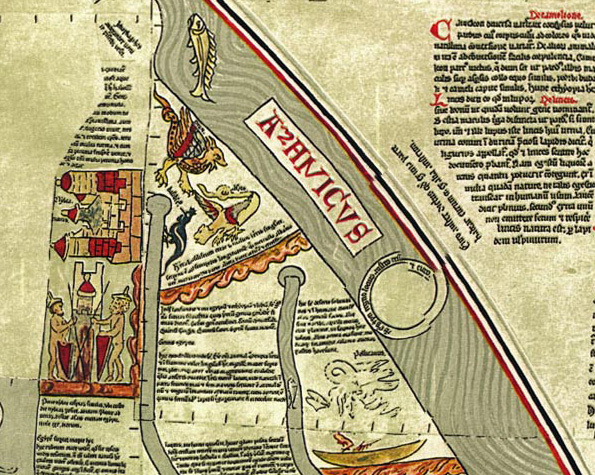 It seems that the earliest map we know of with a proper dragon on it was the Ebstorf map from the 13th century. (The dragon has the company of a basilisk and some other strange critter, too.) 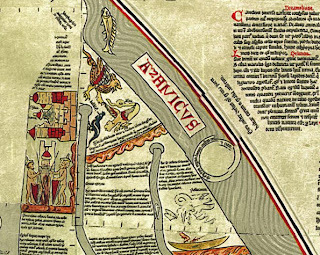 The Ebstorf map was made from 30 goatskins and measured 3.6m x 3.6 m - That's a serious map. It was destroyed in the bombing of Hanover during WWII, but luckily there were at least several photographs and reproductions of it that had been made before it was lost forever, just one more casualty of war. Another nice example is the "Carta Marina" of Scandinavia (1539), which has a wealth of fabulous monsters in the oceans, plus a beautiful wyvern way in the north (in the upper right of this detail). But the question of where the "Here be dragons" myth came from turns out to be a mystery. Apparently no one can explain it! There is a nice summary of the question by Erin C. Blake. I find it fascinating that something can have such a hold on the popular imagination without any apparent source! Of course the idea that this phrase was common on ancient maps must have gotten started somewhere. Someone must have started the rumor… but apparently no one's tracked it down. There's one final twist to the story. According to Wikipedia, ancient Roman and Medieval maps actually had unexplored areas marked HIC SVNT LEONES - "Here are lions" - as a warning of unknown perils. 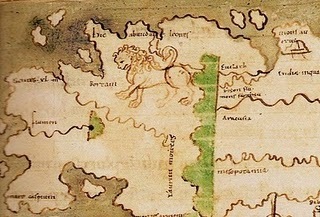 Several sources mention this, and "Here be lions" seems to be a well-known phrase in Europe (although I'd never heard it before), just as everyone knows "Here be dragons..." But this is the thing -- nobody seems to mention many actual examples of maps that warn of lions in unexplored lands. I wonder whether the lions might be almost as mythical as the dragons. Better just stick with Terra Incognita if you want to be safe… But if you want to be enticing, I say go with dragons! Frasconi has illustrated quite a few books, including a number of bilingual children's books, which is where I had seen his work first. In the children's books his pictures often include blocks of flat color that I don't like so well, so I was delighted when I started looking up more of his work and found that he also does lots of black and white that I really love. 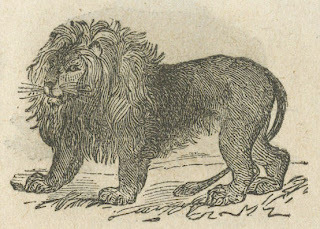 range of subject matter that I find fascinating: the murder victims of "The Disappeared," animals, architecture, fables, portraits, and more. 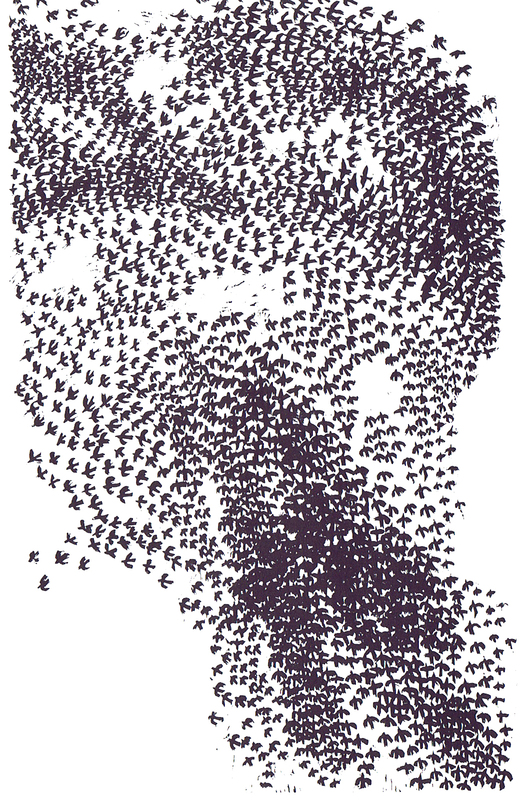 For example, his "Migration" pieces are really interesting. 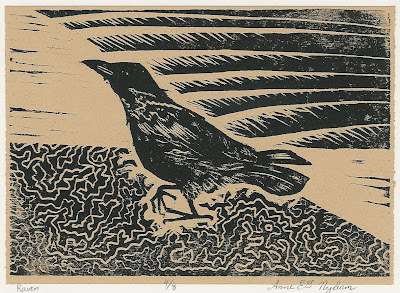 There are other pieces that I find much more pleasing, but I think it's cool that Frasconi chose the wheeling flocks of birds as his subject, and I admire the patience it must have taken to carve. But regardless of the variety of subjects, Frasconi's style always emphasizes the look of the wood. Look how the grain of the wood is visible in this piece. I love the interplay between the lines of the wood grain and the carved lines of the bricks. I love that Frasconi didn't try to hide the wood grain, or smooth it away, or fight it, but instead let it enrich the texture of the old building. A 1974 book of his work is called Against the Grain, but I don't think that's the right title at all. I know they were trying to be clever, but what I find so wonderful is how well Frasconi cooperates with the grain. 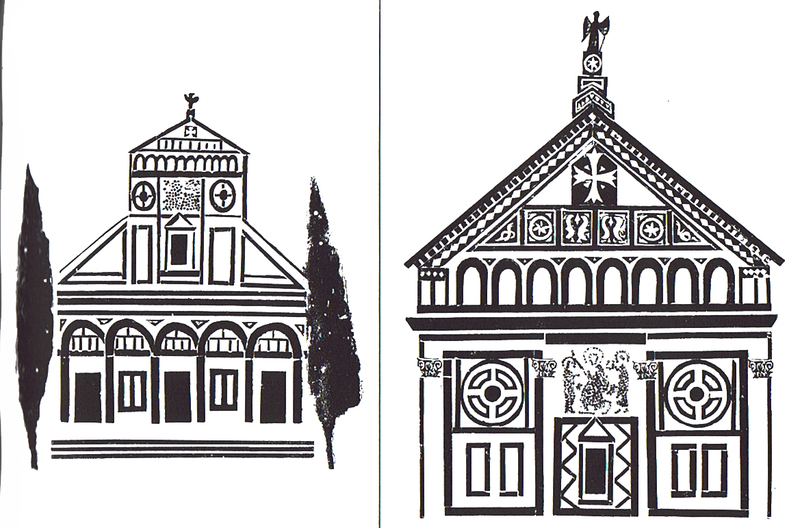 I think my favorite pieces by Frasconi are the architectural ones, (including the strangely beautiful oil rigs above). Something about his rough yet warm style seems really suited to capturing the geometry of human-built structures, yet imbuing them with a touch of life and humor that makes them seem truly human. Portrait of Albert Einstein, wood block print by Frasconi, 1952. Variety vs Ease - There are an infinite number of possible sound combinations, but only a very narrow selection of them that native speakers of English can handle. Readers don't like names that are too long or too hard to pronounce. But at the same time, when a book involves characters who are supposed to represent multiple cultures, yet their names all sound like the same language, the reader is getting mixed messages about the world. How different are the cultures really if they all speak the same language and all name their children from the same pool of possibilities? I admit that I may have an abnormal interest in those details. I majored in linguistics in college and have an enduring fascination with the broad range of possibilities within human languages. Different languages have different sets of vowels and consonants and different patterns of syllables, and of course different cultures have different naming conventions. In my Otherworld Series I've given each different culture a different set of phonetic rules for name-building, so that from a character's name you can tell where they come from. I think this is really cool - but the inevitable side effect is that I've been guilty of some names that are too long and/or too hard to pronounce. (One of the main characters of the third book Return to Tchrkkusk is Chlukash. The words and names of her people, the Tchrkkym, aren't really unpronounceable if you just remember that R and Y can be vowels, which is perfectly reasonable in several human languages, but just not English. Wouldn't it be a little strange if every language in the Otherworld built its words by the phonetic rules of English? And yet, of course, my readers are all readers of English.) The stranger the names are, the harder they are for readers to remember. And if readers can't remember which characters are which, they aren't going to enjoy the story as much. All language is a balancing act between information and ease, and you can really see this principle at work in fantasy names. The speaker (or writer) wants to impart as much information as possible, but the hearer (or reader) doesn't want to have to work too hard to interpret all that information. If the writer tries to put in too much information, the reader gets bogged down. On the other hand, the writer wants to keep things efficient and simple, while the reader wants to be told the whole story. If the writer oversimplifies, the reader isn't satisfied. Names are so much more than just a tag or serial number. They evoke entire worlds. And that's the fun and frustration of fantasy names. Which fantasy names do you really love - or really hate? I just dropped off a few pieces for a group show leading up to Natick Artists Open Studios, and I've already started the first stages of work for Needham Open Studios. These days I'm doing four "Open Studios" per year... but not one of them is actually an open studio for me because I always opt to show in group space. However, I know that I am always curious to see other artists' work space so, in accordance with the Golden Rule, I thought I'd offer a Virtual Open Studio, showing where I work. always more trouble than it's worth, alas.) The big shelf behind is where I store all sorts of random craft, sewing, and office supplies. (And the shelf above it is all the volumes of my journal.) I'm sorry to say that a lot of stuff also tends to pile up on the right end of my table, so that my work area decreases and decreases until I can't stand it any more and I clear everything off. Then as soon as I finish a project the piles start encroaching again. The other view shows my computer desk, used for writing, of course, and all the photo-shopping, and web site work. To the left is a very nice cabinet saved from our old kitchen. That's where all my block printing supplies live. The top of it serves as a cutting table (but it, too, tends to get piled upon, making it a much smaller cutting space than it ought to be… And recently it has a layer of aluminum foil over the top all the time to keep our new cat from nesting up there.) To the left of that, on the edge of the picture, is my supply of mat board, covered in a dark blue blanket to protect it. When I print an edition I lay the pieces out on the tops of everything to dry. I also have a nice shelf in the basement to keep the frames, print racks, the whole stock of matted prints, note cards, and books, etc. So I've really got a very sweet situation here… a far cry from the days when I worked on the only table and had to clear everything away whenever we wanted to eat a meal! When P and T are home they're usually active in the next room, just beyond the mat board, which is why I can't write much while they're around. But the older they get the more work I can get done, and of course school's about to start again, so I'll have no more excuse to keep me from getting back to work. I'll be in this one small area for the majority of every day, having fun. I love my table and my art supplies. I love my computer. I love the sunlight coming in my windows. I love the view of the neighborhood. I love the birds that come to the bird feeders right outside. I love my studio!